Red Rooster Air Hoists are synonymous with their bright red colour, robust design and high lifting capacities. Red Rooster (R.R.) is one of the UK’s leading manufacturers of air powered lifting hoists. Used across a wide range of industrial areas and marine environments as well as hazardous areas with most hoists being ATEX rated for group 2 as standard . Typically found in heavy industries, the oil industry, power plants, foundries, engineering, explosives and many more. Safety is a top priority for R.R. and their pneumatic hoisting systems have been extremely well tried and tested over the years resulting in many engineers and operators that will always use Red Rooster air hoists because of the high safety factors, efficiency, reliability and long working life. All hoist parts are manufactured in Europe or Japan to high standards under ISO 9001:2008 quality control systems. R.R. hoists conform to all EC and machinery directives and the European standard for hoisting systems BS EN 14492-2. All R.R. air hoists incorporate name plates indicating the serial number for traceability of the hoist, the safe working load, the model, year of manufacture and manufacturers contact details. This should remain intact and visible at all times. All R.R. hoists are issued with standard certification including an EC declaration of conformity, a thorough examination certificate to show it is safe to use and an ATEX certificate if applicable, other certification may be available on request. If the ATEX rating has been increase a further plate will be added. One of the main benefits to a R.R. air hoist is that they are easy to operate and control. 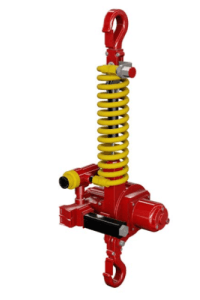 They are also simple to maintain and there are an abundance of spare parts available, so worn out or broken components can be replaced without the cost of replacing the whole hoist. 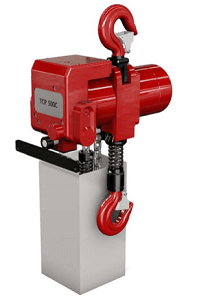 These Air Hoists have many safety features which include top and bottom travel limiters, load limiter for overload protection, disc brake failsafe and an emergency stop button on pendant control models, All hoists have a safety factor rating of 5:1. So whether you need an air powered hoist for a heavy duty application, for use in a harsh or explosive environment, or just need a robust, reliable hoist, then look no further than a R.R. air hoist. Lifting Hoists Direct can supply any Red Rooster air hoist direct to you at the most competitive prices.